Here’s How You Can Get Those $120 Bottles of Black Truffle BeerThere are only 500 bottles up for grabs, and you have to pick it up in Chicago. $120 Truffle Beer Headed to NYC Restaurants“Hand-shaved” black Perigord truffles are the reason for its astronomical price tag. ‘Devil’s Fruits’: The 12 Most Heinous Truffle AtrocitiesSome of the most abhorrent truffle-related misdeeds, ranked from least egregious to most. The NoMad Is Selling White Truffles at CostNo markup! Tuscany Vs. Tennessee: Inside Spiaggia’s Lavish Truffle Dinner With BlackberryTruffles everywhere at dinner comparing old and new world fungi. Tennessee and Tuscan Truffles at SpiaggiaBlackberry Farm chef descends upon Spiaggia for a Friends of James Beard House truffle dinner. Eight Cute Truffle-Hunting Dogs and PigsBonus: They probably smell like truffles! Rolling: British Chef Allegedly Doses Kids’ Desserts With EcstasySo much better than party favors. The Aviary To Debut First Brew; Homaro Cantu Gets Big Truffle, Denies ChrisHomaro Cantu says comment section rumor isn’t so, imagine that! Dock Street and Four Seasons Brew a Truffle BeerSo far the collaboration between the brewery and the hotel has resulted in the production of a truffled old ale. Thieves Will Basically Steal Any Kind of Food You’ve GotTurns out truffles and fryer oil are equally appealing targets for burglars. More Booze Is Being Offered in More Places at Atlantic City’s Casinos;Plus: Global food prices are expected to remain high; and in Japan Wendy’s burgers come with foie gras and truffles, all in our morning news roundup. Bistro 5 Does TrufflesAnd they’re not even that expensive! Soon, Bostonians Won’t Have to Hunt for TrufflesA truffle emporium will soon debut in Boston. French Farmer Kills Alleged Truffle Thief; Ginnifer Goodwin Has Dieted Since AgePlus: new standards proposed for kosher food, Paula Deen’s former housekeeper sentenced for jewelry theft, and more, in our morning news roundup. 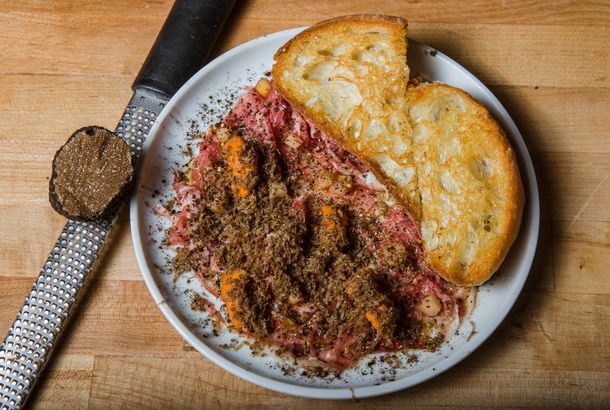 Michael Yeamans Is Back in at Rouge and Cranking Out Truffle DishesNewly installed chef Michael Yeaman has a long history with the Rittenhoue Square stalwart. Helpless Upper West Siders Suffer Tyranny of Too Many TrufflesThey’re great on macaroni and cheese, and french fries. Not so great perfuming your apartment lobby. Gorge on White Truffles at Sapori d’Ischia’s Recession-FriendlyHead to Queens for a four-course, 60-dollar white-truffle dinner. Patina Obtains One-Pound TruffleTony Esnault has three nights of specials planned. Eat White Truffles Without the GuiltGet three Alba-truffle–strewn courses plus dessert for $50 in Woodside. The $75 White Truffle Cupcake Is A Real Thing That You Can BuyMore Cupcakes creates an absurdly decadent snack cake. What to Eat While Cecconi’s Has White TrufflesWhite truffles make an early appearance at Hollywood’s Cecconi’s. Hershey’s Tells Jacques Torres to ‘Kiss’ His Champagne BonbonsEveryone’s favorite small-time chocolatier is telling big chocolate to kiss off. Global Warming Endangers Black Truffles; Gourmands Despair at God’sWe had a good bit of sport over the astronomical prices paid this past summer for white truffles in New York restaurants. But what if their black cousins, long the déclassé branch of the family, became even more expensive? Or disappeared entirely? That wouldn’t be so funny. And it wouldn’t be good for the price of white truffles, which, like Beluga caviar and shark-fin soup, could become a purely plutocratic pleasure sooner than we expected. (Not that truffles are evil in the way of Beluga caviar and shark-fin soup; we’re just thinking of endangered luxury foods, you understand.) An article in USA Today suggests that the global warming is currently bringing the hammer down on black-truffle production and that (gasp) “France’s black truffle will one day be just a memory.” It’s a similar story around the world, as fish stocks are depleted, ecosystems are knocked out of whack, and global demand for things like toro and truffles move beyond a small cluster of ascot-wearing bons vivants. Biggest Truffle Yet Commands Record Price, Blah Blah Blah“This looks like the brain of a man … but it’s nice, very nice,” says Alfonso Iaccarrino, chef at the Lisboa Hotel in Micau, the new owner of the world’s biggest and most expensive white truffle, a 3.3-pound monster for which the hotel paid $330,000. That’s way out of proportion to the already insane low-double-digit figures being paid for previous giant truffles, but since there can apparently never be too much truffle coverage, it’s our grim duty to direct you to it. Grub Street is your source for truffle news on the march, even when they look like brains. Giant Truffle Sold at Auction [Reuters] Related: What Chef Rides the Truffle Train for Free? Breaking: Another Freakish White Truffle Comes to Town Have White Truffles Finally Gone Too Far? What Chef Rides the Truffle Train for Free?Last we heard, white truffles were going for about $3,400 a pound. If we know, the chefs certainly do, which makes the following story so awful: It seems that a certain well-known chef came into one of the city’s top Italian restaurants recently and having announced himself, proceeded to order a tasting menu — with lots of truffles. Course after course came out, including several with the prized shavings on them, each one described in person by the restaurant’s equally famous chef. But when it came time to present the bill, the visitor wouldn’t pay it, claiming to be just a hardworking fellow cook. After much fury in the kitchen, and to avoid a further scene, the chef’s truffles were comped. He received a nominal bill of a $130 for the feast and tipped $20. That’s all we can say, we’re afraid, but if you have any guesses as to who the parties involved might be, feel free to make them in the comments. If you get it right, we will nod knowingly here at our desk. Earlier: Have White Truffles Finally Gone Too Far? Have White Truffles Finally Gone Too Far?We have some bad news. The bagel, that beloved, affordable symbol of New York cuisine, has gentrified. Chef Frank Tujague of the Westin hotel in Times Square (where else?) has unveiled the $1,000 white-truffle bagel, “topped with white truffle cream cheese and goji berry infused Riesling jelly with golden leaves.” Now we love all truffles, far too much to ever be so rash as to declare them to be so over, and there may not be a thing on earth that’s not improved by them (we’ve even considered using truffle oil as conditioner — it probably works wonders for split ends). But now that truffles are toying with the doughy purity of simple bagels, we have to wonder: Is this white-truffle thing not getting just a bit too precious?